The four daughters of Ramon Berenguer IV, Count of Provence (1195-1245), and his wife, Beatrice of Savoy (1205-1267), all became queens. The Sister Queens is the story of the two eldest, Marguerite, who at 13 was married to Louis IX of France, and Eleanor, two years younger, who is married to Henry III of England eighteen months after her elder sister becomes Queen of France. Both sisters inherited the comeliness of their mother, a legendary beauty from the powerful and ambitious Savoyard family, but their temperaments are very different. Marguerite is controlled and elegant; Eleanor is fiery-tempered and strong-willed. Their marriages are also very different. At first, Marguerite is pleased with her handsome, youthful king, but she soon becomes unhappy. Her mother-in-law, Blanche who served as her son’s regent during his boyhood, is jealous of her influence and power and determined to limit Marguerite to the fringes of Louis’ life. She fosters the religious zealotry that makes Louis an indifferent husband even as the principles of his faith applied to his rule make him a powerful and effective king. Eleanor has reservations about her marriage to the English king who is only a decade younger than her father, but Henry’s age and unimpressive looks are soon forgotten in the face of his delight in his lovely bride and his eagerness to wed. He is Louis’ opposite—a loving, devoted husband but a weak and ineffectual ruler. But, despite their differences, the sisters are devoted to one another, and neither time, distance, disagreements, nor the political rivalry of their husbands destroys that devotion. They share their lives with one another through the letters that they exchange, they learn from one another, and eventually see a more cordial relationship established between their husbands. The story covers just over twenty years (April 1234-January 1255), beginning the day before Marguerite leaves her home in Provence to journey to France for her marriage and ending with Eleanor and Henry’s departure from the French court. Perinot presents not only the sisters but also the kings they married and a cast of secondary characters as complex and vivid characters with contradictory qualities that contribute to their complexity. Henry is a romantic, indulgent husband and a doting, involved father, but he is also impulsive and easily influenced, not characteristics associated with wise and able rule. Louis, on the other hand, is highly competent in administering his kingdom with admirable courage and a sense of justice, but he is a religious fanatic who withdraws emotionally and often physically from his wife and who can order that the lips of a man who profanes the name of God be burned off. As interesting as the stories of kings and their choices are, the heart of this book is the relationship between two sisters. The alternating chapters and the inclusion of the fictional letters between Marguerite and Eleanor insure that readers are propelled into the intrigue and jockeying for position in the royal courts of France and England and the purpose and the terrors of the Crusades, but they also reveal the hearts of these two women—their memories of Provence and family ties, the concerns they have for their own children, and the struggles each faces as the dreams of girlhood are replaced by the realities of womanhood. Connecting all these things are the strands of jealousy, competition, forgiveness, loyalty, and abiding love that make up the bond of sisterhood. 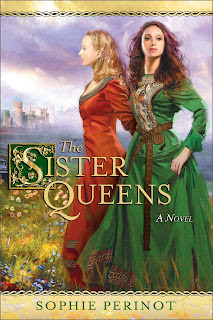 If you are a reader of historical fiction or a fan of Medieval romance, I highly recommend The Sister Queens. If you are neither but enjoy stories about the many relationships that define a woman, you may find more to like here than you expect. This is an impressive debut novel, and I for one am looking forward to seeing what Sophie Perinot does next. This is how I love my history, all wrapped up in a great read. Thanks for the review Janga. This sure sounds interesting to me. I adore stories about sisters. Thanks for the informative review of The Sister Queens. I haven't read any of Sophie Perinot's books but you made this one catch my attention. My favorite genre is historical fiction but my husband prefers reading history and historical novels. I'm always looking for books that would be of interest for both of us to read and be able to discuss and I know that The Sister Queens offers us just that. Wow, this book sounds fascinating, Janga. Not only in reference to the sisters' marriages, but their relationship with each other. Thanks for the terrific review! Ohhhhh, I like medieval almost much as highlanders! This certainly sounds like a book to look forward to and savored. I am a fan of both historical fiction and historical romance, especially medieval set books. This one will go to the top of my Wish List. Thank you for the review. This sounds like quite an impressive work for a debut writer! Thanks for the equally impressive review, Janga.